January 20 is National Cheese Lover's Day. There are lots of facts about cheese that you might find interesting. Cheese is ancient food. People had started making it before the first history records were made. 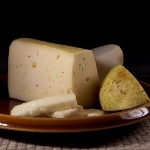 It is believed that the first cheese appeared in what we know today as the Roman Empire. Ancient Romans developed many varieties of cheese and distributed them to the territory of modern France and England. The kinds of cheese we enjoy today are relatively young. For example, Emmental (Swiss cheese) has been made around the first century BC! There are more than 900 known cheeses in the world. All of them can be classified by texture. We give you some examples of primary classification of cheeses: fresh cheese, soft cheese, semi-soft cheese, semi-hard cheese, hard cheese, double and triple crème cheese, blue cheese, washed rind cheese and bloomy rind cheese. The average American eats about 31 pounds of cheese each year. This may seem like a lot, but the average French eats about 50 pounds of cheese a year. They are real cheese lovers! By the way, don't serve cheese cold. Let it stand for half an hour at room temperature. This will make cheese more flavorful and tastier.